The purpose of the Basin Management Plan Committee (BMP) is to provide a framework to investigate all practical projects and programs that contribute to the efficient and economical management of existing and supplemental water supplies. The goal being to aid PV Water’s work to prevent further increases in and continued reduction of long-term overdraft and to ensure sufficient water supplies for present and projected needs in the Pajaro Valley. The BMP is tasked with bridging the gap between the community and PV Water by finding solutions that are initiated by those who will benefit and are financially responsible for their support. The BMP will also serve as an advisory committee to the PV Water Board, so that Board decisions are fully informed and affected and guided by the community’s interests. 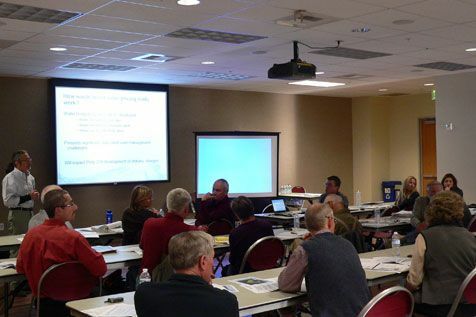 Upon completion of the committees work, a Basin Management Plan will be created that identifies a preferred list of projects and programs, their integral timing and costs, and their acceptance by the community. The last meeting of the Ad Hoc BMP Committee occured on August 15, 2012. Matterials from that and previous Ad Hoc BMP Committee meetings are available by contacting our office.